In one of a series of gaffes, he seemed to admit in a television interview that the private security firm, Blackwater, was active in Pakistan. ….Gates went to Pakistan to emphasize to Islamabad that the US was not again going to abandon it and Afghanistan, as it had in the past. Pakistan, he wanted to say, is now a very long-term ally of Washington. He hoped for cooperation against the Haqqani, Taliban and Hizb-i Islami guerrillas. He wanted to allay conspiracy theories about US mercenary armies crawling over Pakistan, occasionally blowing things up (and then blaming the explosions on Pakistanis) in order to destabilize the country and manipulate its policies. 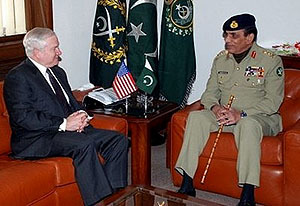 The message his mission inadvertently sent was that the US is now increasingly tilting to India and wants to put it in charge of Afghanistan security; that Pakistan is isolated; that he is pressuring Pakistan to take on further counter-insurgency operations against Taliban in the Northwest, which the country flatly lacks the resources to do; and that Pakistani conspiracy theories about Blackwater were perfectly correct and he had admitted it.